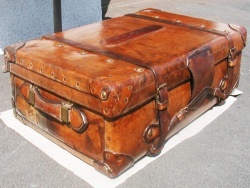 Vegetable tanning refers to leather that is tanned with oak and spruce bark. Also quebracho, tara pods, olive leaves, rhubarb roots or mimosa are common. These substances are placed in a pit along with the skins and hides. 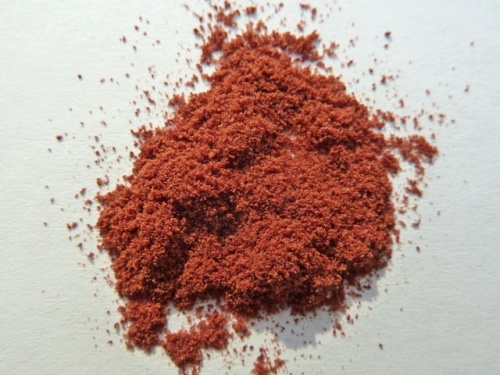 As these tannins are derived from plants, the leather is called vegetable-tanned leather. Also the term "natural leather" is used. Tanning with plant substances has existed for over 5,000 years and was, for many centuries, the main tanning method. Ornaments placed on stone coffins reveal that vegetable tanning was around in the 4th millennium BC in Egypt. Since the discovery of Ötzi in the ice of the Alps it is evident that several leather types were prepared for various uses even 5,000 years ago. Recently, the more modern and industrialised tanning methods have become common and it can be assumed that nowadays only 10 - 12% of all leather is vegetable-tanned. Vegetable tanning is based on tannins (polyphenols and gallic acid) which are found naturally in plant species. Plants store these as a defence mechanism to ward off attacks from potential predators whose digestion is adversely affected upon consumption. Tannins are found in varying concentrations in different plants. In addition to the plants mentioned above, tannins are also contained in wine, chestnuts, hops, sumac and black and green tea. In food, tannins are perceived as dry, rough and furry. The taste of red wine is fundamentally influenced by the type of tannins and their concentration. Many plants used for leather tanning require up to 30 years growth, to allow sufficient amounts of tannins to be produced. Other plants contain more tannins when they are younger. There are around 300 different plant species worldwide, which can be used for tanning. 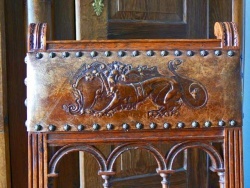 Oak is suitable for all leather. Oak and spruce bark from younger trees are used, because they contain more tannin. 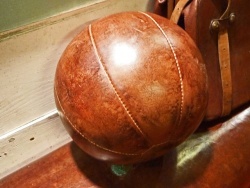 Chestnut gives a hard and reddish leather. Mimosa bark and Acacia make leather rather pliable and supple. Valonea is a Mediterranean, wild species of oak, which grows mainly in Turkey and in Greece. Dried Valonea acorn cups (also called Trillo) have a high tannin content, between 32% and 45%. Valonea is used to make soft and tough leather. Valonea-tanned leather has higher colour-fastness ratings in comparison to other vegetable-tanned leather. Bark from the flat topped yate or swamp yate (eucalyptus occidentalis) has an extremely high tannin content of 46 - 49%. The tree grows in West Australia and is up to 25 meters high. Since the plant is now rare, the tannin is hardly used. In Middle Ages Europe, forests were cultivated with tannin-rich oak varieties. The tannin-containing bark of the trees was peeled off and brought to mills. These mills were mostly located close to tanneries. Oak bark contains about 10% tannins (in older trees about 5%) and oak apples up to 70%. 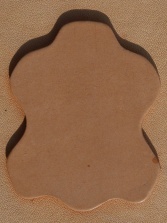 The resulting leather is light brown. Spruce bark has 15% tannins. However, in spruce wood it is a maximum of 1%. Also, this leather is light brown. Chestnuts can reach 10 percent tannins in wood of old trees. The leather is medium brown and chewy. Willow bark has 10% tannin and delivers yellowish leather. The bark of old birch contains 10% tannins. 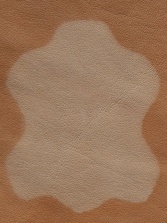 The resulting leather is also yellowish and soft, but resistant. Valonea has a very high tannin level with 32%. The leather is tough and solid. Galls or cecidia contains 55–65 % tannic acid. There are over-growths on plants through the eggs of insects. Around the larvae, tannin-containing growths develop. The countries of origin are Hungary, Yugoslavia and Austria. 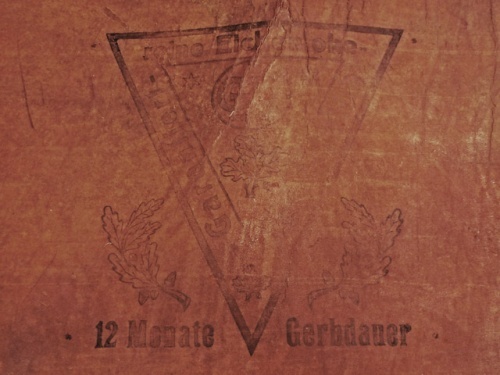 Leather tanned with oak with stamp: "pure oak wood - 12 months tanning period". The vegetable tanning process takes about 20-30 months. Per Skin about 30 kg of bark or 20 kg of fruit or 90 kg oak wood is needed. 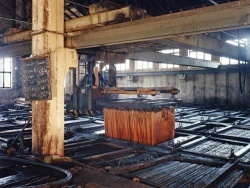 In 2009, world demand for vegetable tanning raw material was about 130,000 tonnes. The tanning agent is placed together with the hides in water-filled pits, resulting in a bath containing tannic acid after a few days. The skin is regularly exposed to additional baths with higher tannin concentrations. 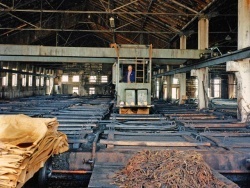 During tanning, the leather hangs in pits that are filled with the tanning liquor. Vegetable tanning with oak tannins. Vegetable tanning in Tuscany, Italy. Besides the term "vegetable-tanned leather", terms like "natural leather" or "bio leather" are in use, since the tannins are derived from natural raw materials. Some people react to chromium VI, which is rarely found in leather. Therefore, some people look for chrome-free leather or pure vegetable tanned leather to avoid possible allergies. As tanning methods can be mixed in the leather production, it is important to ask for chrome-free leather (FOC = Free of Chrome) to be sure. The term "vegetable-tanned leather" doesn`t assure this alone. 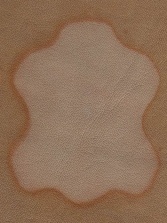 In Europe leather may only be labelled as vegetable tanned without additional information if the total content of the tanning metals (Cr, Al, Ti, Zr, Fe) does not pass 0.3% of the dry weight. If the proportion is higher, the goods must be declared corresponding. 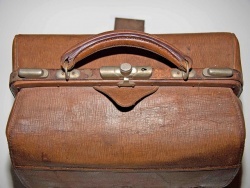 Vegetable-tanned leather is usually recognized by the brown colouration. Since plant tanning dominated long before chrome tanning, in particular old leather is mostly vegetable-tanned. Today only thick and firm leather is vegetable-tanned. For high-quality shoes, e.g. for the leather soles. The dyes in aniline leather or the pigments on finished leather become lighter by light (fading). In the case of uncoloured vegetable-tanned leathers, it behaves differently. The leather darkens by light, moisture and fat. 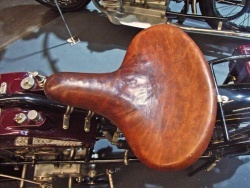 Vegetable-tanned leather, which was never moistened or oiled or greased, will become darker first, but will become brighter later as a result of drying. Probably this effect is related to fats and oils in the leather. At first, grease moves up to the top of the leather and darkens, but the dryness makes it brighter with time because the fats slowly dry out. 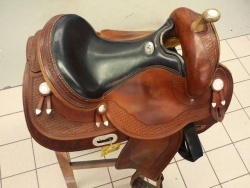 But as soon as water or grease gets onto the leather, it darkens strongly. Vegetable tanned leather day 0, day 16 and day 50 in sunlight.